Loans are given to tsunami victims who lost their business and wish to start again. Loans are given to maybe open a small grocery business or add a sidecar to a motorbike to aid transportation of goods. Loans are also given to buy initial stock when setting up a business. All loans are interest free. In the aftermath of the tsunami, donations included thousands of pieces of clothing. Even after their distribution to the people living in camps and shelters, heaps of clothes remained in each of the camps. The oversupply started to present a challenge: residents were concerned about mosquitoes breeding and the growth of mold, particularly in the rainy season. A resourceful volunteer had the idea to create "Tsunami Dolls," both a hand-sewn memento and small business opportunity for the women who lost their jobs or businesses as a result of the tsunami's destruction. Some of the best selling handicraft products in the Phang Nga region, the dolls are simple in design but have tremendous symbolic value. The grains of sand that fill them represent the lives of those who perished, survived and came to help. Though the piles of donated clothing are now gone, the groups use factory seconds and other fabric scraps. A word stitched to the front indicates "hope," "spirit" and "renewal" for the future. The women also released a special, limited-edition holiday ornament package. 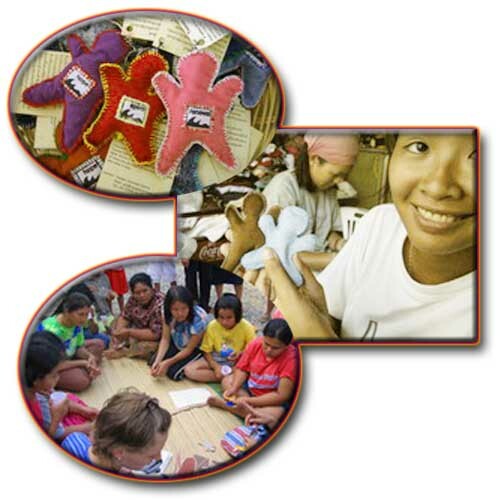 Outcome: Currently, there are more than 40 women in one camp and three villages making the dolls. By October, more than 5,000 dolls had already been purchased. Ninety percent of the profits go directly to the women.